In high school, one of my favorite history teachers, Mr. Mazzullla, was a Vietnam Vet. As a result, for the first time in my academic history, we actually spent time talking about the Vietnam War. Hearing Mr. Mazzulla's first-hand accounts of the Vietnam War has always made me interested in it. 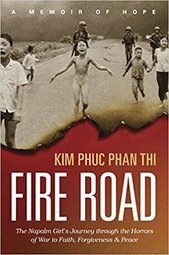 For that reason, I was excited to read Kim Phuc Phan Thi’s Fire Road . Even though you may not recognize Kim’s name, you’d likely recognize the picture that made her famous: That of a girl running naked through the streets of Vietnam after Napalm bombs dropped from the sky, burning away her clothes and deeply scarring her skin. Fire Road is the story of the day the napalm bombs fall and the suffering that results. According to Kim, “My suffering, which had begun on that fateful 1972 day, would not be confined to a thin slice of time.” Throughout Fire Road, Kim details much of her physical and emotional suffering, as well as what it was like for her to be a publicity prop in a communist regime. Fire Road is a vulnerable, brave exploration of one woman’s experience of the Vietnam War. It sheds lights on a period of history that needs to be talked about more extensively. For that, it should be applauded. However, make no mistake. Fire Road is not so much a war memoir as it is Kim’s story of how she came to Christ. Those interested in that will love it but those primarily interested in the story behind the famous picture of the Napalm girl will be sorely disappointed. Disclosure: I received a free copy of Fire Road from Tyndale Blog Network in exchange for a fair and honest review.